Last night I volunteered at the women’s shelter at St. Paul and St. Andrew’s. I sat around with six volunteers and my family of five (whom I’d made come to drop off the homemade cookies). My husband and son cut out as soon as we finished our job of setting the table with plasticware and my son was assured he’d get community service credit for the help. “No,” I said. “I’m just being friendly.” I was embarrassed. Behind the woman’s back, one of my daughters, C., lifted her eyebrows at me protectively. I rolled my eyes, shrugged. Maybe, at times, I can be too friendly. Maybe she didn’t want friendliness, she just came for dinner and shelter. I didn’t mind. I chatted with a woman who sat beside us. 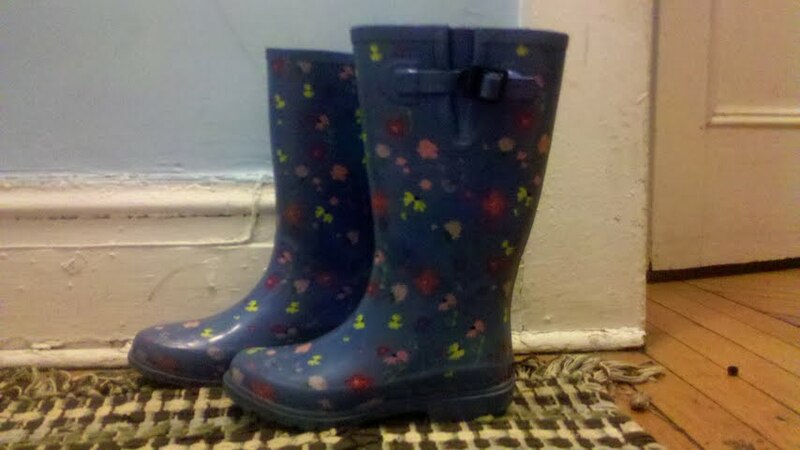 I complimented her on her camouflage-patterned rubber rain boots. We chatted about the ease of slipping on rain boots and all the pretty patterns they come in nowadays. One of my daughters has a pretty pair. I suggested, “How about a quick grace first?” Then I asked my boot-wearing friend to lead us in prayer. She stood up in the center of the room and blessed the food. I think that’s what she did, I couldn’t hear her too well and she mumbled. It was a short prayer and heartfelt — my favorite kinds. The girls and I left before dinner. As we said good bye, the Do-I-know-you-woman gave me and the girls a big smile — a huge silly giggly smile — like a kid who’s made a new best friend. We smiled equally wide back at her. “No problem,” I said. And for some reason, she reminded me of my mother. We hopped in a cab and came home. I don’t know which of my rules this experience relates to. Maybe to the rule about Expect the Best, Love What you Bet. Even from your overly friendly self.